The story of western painting – from Ancient Egyptian tomb decorations to modern art – told clearly and simply and published in association with The National Gallery. Beautifully illustrated with over 160 of the world’s greatest works of art, this introduction focuses on key works and artists as well as themes such as religion, royalty, magic and love in art. A pleasure to read and an essential reference for every family library with an art history timeline, artists’ biographies , and information about conservation and artists’ materials. 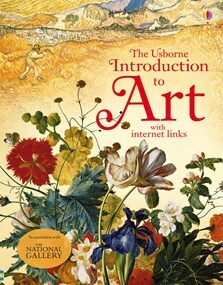 Includes internet links to see thousands more artworks online.